Have you ever wondered how trees in the forest become lumber for your backyard deck? Or a hardwood dining room floor, or chairs, or baseball bats, or a million other things? The process of getting timber from its raw, untreated form to a finished product is filled with plenty of good old fashioned sweat, hard labor, chemicals, transportation, logistics, warehousing and plenty of other steps along the way. And at pretty much every step in that process, specialized forklifts help move, store, and manage all that raw material – and help get it to the final, store-bought product! That’s right – those powered industrial trucks are critical in all facets of lumber harvesting, treatment, and production. To put it another way, about the only things more important than forklifts to the timber industry are…trees! Here’s another important element of forklift in the timber and lumber industry: training. ForkliftCertification.com, the leader in online U.S. Occupational Safety and Health Administration (OSHA) approved safety training, offers unmatched knowledge, convenient anytime access, and lifetime support for all of your compliance needs. OSHA requires that every U.S. employer – including lumber companies, big box retailers, and every other facility involved in the timber industry – offer their workers complete safety training. For many companies, that’s a big problem. How can they find the answers they need with OSHA regulations? How should your employees be tested to prove they know how to operate specialized forklifts? And what about renewal training? You have many questions, and ForkliftCertification.com has the answers. Our safety courses show everyone from rookie forklift operators to seasoned veterans the latest and greatest OSHA specifications, and we create our training courses around this content. The bottom line for employers: well-trained forklift operators with a safety-first approach! There are five primary steps in making trees into finished lumber. As you’ll see, each step requires heavy-duty machinery to move and manage all that timber. Next up is the transport stage. During this process, logs are held in an easily accessible area in the forest until they’re required at the mill. The waiting process is important a clearing or in the forest until they are needed for production. While they wait to be transported to the mill, the logs dry out somewhat, making them a big lighter. Once dry, the timber is cut into smaller sections and put on trucks for transport. The third (and maybe most crucial) step occurs at a sawmill. The bark is removed, and logs are cut to specified lengths. Then, logs start to resemble the product you see at lumber yards – they’re cut into boards (2 x 2, 2 x 4, etc.) for further processing. Sawmill lumber management is impossible without specialized forklifts, such as rugged Hyster or Toyota lifts. These two companies produce some of the most reliable specialized forklifts for the lumber industry. Just like a finished plate of food at a restaurant, lumber requires seasoning. This step removes any excess moisture from the lumber, which prevents future warping and other defects. The seasoning stage is often overlooked in the whole process, but is important nonetheless. Versatile 4-way forklifts, like these from Bulmor, help manage lumber during this phase. At last, it’s time to get the lumber to the consumer. The consumer stage further enhances the lumber into (sometimes) finished products, and (other times) cut to more precise measurements. Additional chemicals – for weatherproofing and more – are applied at this stage. Heavy-duty specialized forklifts are used here, and in the lumber yards for moving finished lumber to customer pickup trucks and other vehicles. And that’s it! As you can see, producing finished lumber is a painstaking process. But without specialized forklifts every step of the way, lumber would never make it off the forest floor. Need Training for Specialized Forklifts? Contact ForkliftCertification.com Today! ForkliftCertification.com is your one-stop shop for OSHA compliant forklift training. Whether you’re in the timber industry or employer forklift drivers for other workplaces, we provide everything you need for full OSHA compliance. Don’t trust just anyone with your specialized forklift training. With our Training Kit, Train a Trainer and Bundle Package, your company has a full range of training courses to train your entire timber processing lift drivers. Get started today! 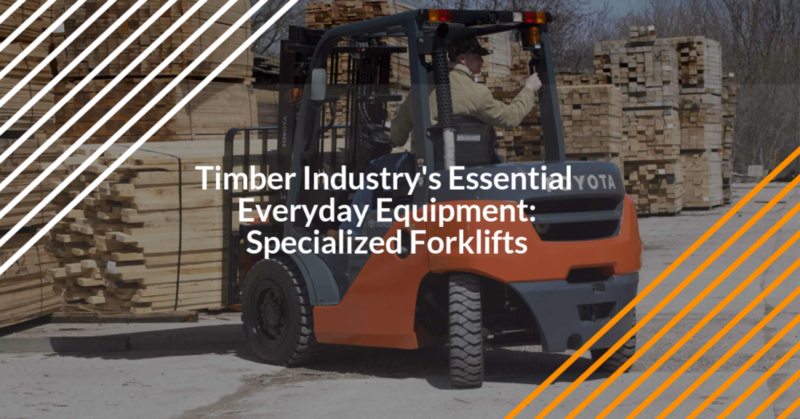 If you have any questions about specialized forklifts, or your powered industrial trucks for the timber industry, call us today at (888) 278-8896. Thanks for visiting ForkliftCertification.com. We look forward to meeting your specialized forklift training needs today!